There is something about building a snowman: rolling big snowballs, piling them up one on top of the other and choosing just the right accessories! Don’t let the cold prevent you from building a snowman. Even if it’s from paper, it can still have all the classic attributes – while keeping its snowman charms. Start by applying a layer of white paint onto the bubble wrap paper. Some kids may prefer to use their fingers others would go for the paintbrush or a sponge brush. Place the bubble wrap paper on top of the blue cardstock paper and press down all over to transfer the paint. 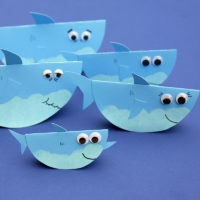 Slowly peel off the blue paper and set aside to dry. Once the paint is dried, use a cup or any other round household item to draw three circles on the blue cardstock paper and cut them out. Glue them together, in a row, slightly overlapping them. Cut out accessories for your snowman: a hat, nose, and scarf. 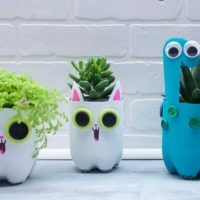 We used ribbon for the scarf and googly eyes for the eyes, but you can cut these out of paper, too. If you choose to do this, use black paper for the eyes and colorful paper for the scarf. Draw the snowman mouth with a black marker. Glue pom poms along the two bottom circles. Use a hole punch to make two holes in the middle circle, one on each side. Slide an orange pipe cleaner through the holes. 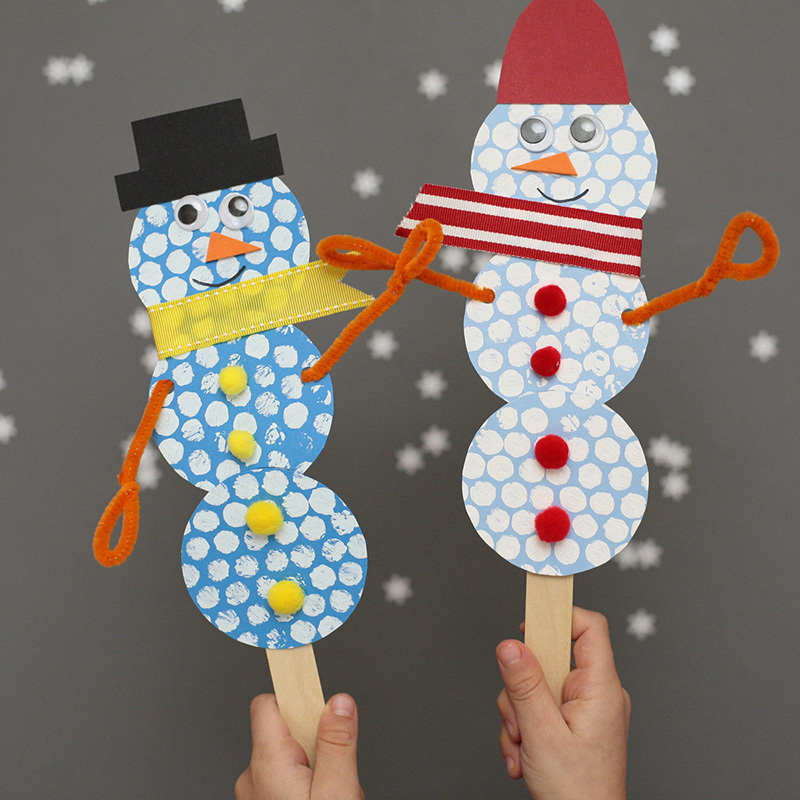 Glue the snowman to a jumbo craft stick. 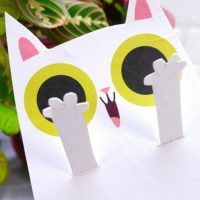 If you have used card stock paper to make your snowman puppet, you can glue the craft stick only to the back of the bottom circle. The snowman will be sturdy enough not to fall back or front. If you used construction paper, make sure to glue more of the snowman to the craft stick, but remember to leave some wood stick exposed so kids can easily hold their puppet.